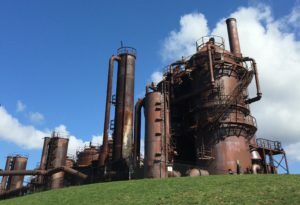 Seattle’s Gas Works Park, one of Richard Haag’s most prominent projects. Emeritus Professor Richard Haag (1923-2018) founded and served as the first Chair of the Department of Landscape Architecture at the University of Washington and rose to prominence as one of the most celebrated landscape architects and beloved professors in the College of Built Environments. Richard made it known he did not want an obituary or memorial service as it would distract from the important work that needs to continue in the public realm. Those wishing to celebrate his life and legacy may consider the Richard Haag Endowed Scholarship in Landscape Architecture, established in his name to support exceptional students who demonstrate a passion for living nature, plants, and horticulture as sources of design inspiration. Donations may be made online at http://giving.uw.edu/Haag or by contacting Claudia Vergara, Assistant Director of Advancement for the College of Built Environments, at claudv@uw.edu or 206-221-4027.